Management systems/management plan: lack of a Master Plan and a complete Management Plan with detailed disaster risk management plan and a tourism management plan. On 6 February 2017, the State Party submitted a report on the state of conservation of the property, which is available at https://whc.unesco.org/en/list/1022/documents/. A draft Management Plan was submitted on 1 March 2017. Detailed plans for the conservation of the Bujjabukua: Efforts have been made to provide temporary shoring for this important traditional building, and measured drawings are provided. A detailed restoration proposal will be prepared in the future, but work cannot begin until the work on the Muzibu-Azaala-Mpanga is completed. Progress on installing the roof rings of the Muzibu-Azaala-Mpanga is welcomed, though this has been slower than anticipated. Much of 2016 was taken up with resolving equipment needs and technical issues, which it is hoped have now been resolved. Problems have also arisen on site with regard to the work of the thatchers. This is expected to be resolved by the end of 2017, and work is now proceeding at a good quality although still somewhat slower than originally foreseen. 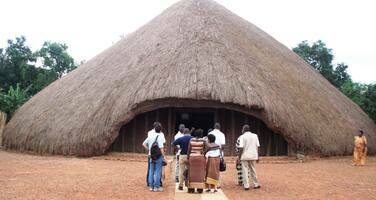 ICOMOS and ICCROM emphasize that ongoing work on the Muzibu-Azaala-Mpanga should continue respecting the traditional construction systems, as the Statement of Outstanding Universal Value (OUV) refers several times to traditional craftsmanship. The reconstruction project should aim not only to complete the reconstruction of the building but also to reviving and sustaining traditional skills. For this reason, it is recommended that the State Party give high priority to augmenting the skilled workforce with experienced artisans, and to resolving cash flow problems that have impacted adversely on the workers. Reports done on the extrabudgetary Japanese-funded project show that the master thatcher, a community elder, is ensuring that the young thatchers have the adequate skills in traditional construction techniques. These trainings are welcomed and are further encouraged. Indeed, training, and overall valorization of the traditional artisans, should be considered a priority. Initial progress with the development of the Master Plan is welcomed and further encouraged. It is recommended that this work be given high priority as it is a means to define, justify and coordinate the various development activities at the property (and around the property such as the proposed Bus Transit System), which currently remain separate and lack detail. It is not possible to comment on the various proposals set out in the annotated plan of the site on the basis of that plan alone. There needs to be a clear differentiation between the Master Plan that concentrates on coordinating development and the Management Plan that puts in place ongoing systems of management. Until the Master Plan is in place, the need to halt all new development is reiterated, and this includes work on reconstructing or conserving buildings (other than the Muzibu-Azaala-Mpanga) and building new structures. The work of the Reconstruction Committee, which has a coordinating role, is also welcomed. It is to be noted that the extrabudgetary project funded by Japan through UNESCO on the reconstruction of the Muzibu-Azaala-Mpanga contains risk preparedness and conservation activities. This project has been put on hold since July 2015 pending completion of the Master Plan. Until the extension of the project is approved, the funding for firefighting is not guaranteed. The ICOMOS technical review (commented by ICCROM) of the fire-fighting proposals recommended that the Pump house and associated oil storage areas be re-located at least 20 metres from the Muzibu-Azaala-Mpanga. From the plans now provided, this recommendation does not appear to have been adopted. The plans provided are dated August 2013, and there is a need to clarify if the recommendations of the technical review have been taken into account. The review stressed the fact that technical measures can only reduce the risk and need to be augmented by fire safety management practices (including banning cooking fires in the vicinity of thatched buildings) as part of a wider risk-prevention strategy. As the reconstruction of the Muzibu-Azaala-Mpanga is likely to be completed before all the fire-fighting equipment is in place, the development of an overall risk prevention strategy remains a very high priority to be developed as part of the completion of the management plan. Such a strategy also needs to address the similarly urgent need for adequate security in terms of lighting and patrols. ICOMOS and ICCROM are concerned, however, about the appropriateness of proposed lighting at the site, both in terms of lamps that are foreseen for the courtyard, and for lighting which appears to be planned for inside the Muzibu-Azaala-Mpanga. It will be important to find lighting solutions that do not become visually distracting and therefore detract from the traditional aspects of the property. The training in firefighting carried out is welcomed and further encouraged. The draft Management Plan provides an organizational chart for site management, and includes action plans for improvement of management practices, site maintenance, preservation of intangible heritage and disaster risk management (DRM). In regard to the DRM Plan, however, it does not appear that much progress has been made on its finalization. Given the strong priority on interim DRM measures and given that the new fire equipment may still take several years to be installed, it is advised that the State Party place a strong emphasis on completing this DRM Plan as soon as possible. There is also no mention of a Tourism Development Plan. In regard to the management framework, there are discrepancies that illustrate a need to reconsider the management structure and make sure that the management plan reflects the realities of management on the ground. For example, the State Party indicates that the current chart reflects the updated management at the property. Yet, while within the text the Buganda Heritage and Tourism Board is indicated as now acting as the site manager, the chart does not reflect this fact. Another example is the Contractor, Omega, which has been let go according to the report, is still within the organizational chart. In terms of timeframe for the implementation of the corrective measures, in the light of a clearer understanding of when the main reconstruction work is to be completed, it is recommended that revised timeframes be approved by the Committee for the other corrective measures relating to the completion and implementation of the Management Plan, the development of the Master Plan and the development and implementation of a risk management strategy, for approval by the Committee.